With two days to go, I can’t believe the play that started off as a discussion in the pub about the challenges women have faced in the UK, is finally being premiered in London on Tuesday. On the whole, women are so hugely self-deprecating about their achievements. We’re pre-programmed to think that by doing this people will think we’re a show-off or big-headed. And ironically, we’re also pre-programmed to believe that might be the case when women do, occasionally, talk positively or with confidence about what they’ve achieved. When told we look nice, why can’t we just say thank you? Why don’t women ever just take the plunge? Say, you know what, what I’ve just done is pretty ace. And I’m proud of it. 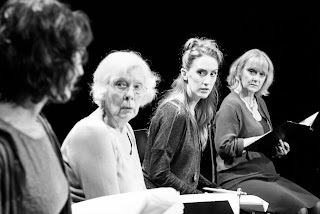 I’m so very proud of the play we have produced- Three Generations of Women. And when I say we, I mean me and my friend Alice, who I run the theatre company, Broken Leg Theatre, with and, who has also co-written the play. I mean the amazing all-female creative team, many of whom are mums and are juggling a ridiculous schedule but never appear anything other than professional. And the hundreds of women we spoke to as part of the research up and down the country who shared intimate, brave stories with us. And the thousands of women who contributed to our website, sharing their experiences with us. I’m so proud of everyone who has been involved in this project, of which there are thousands. And this Tuesday night, we open the play that has been inspired by all of these stories at Greenwich Theatre. So if you can, come and watch it. Come and meet me and Alice and all the brilliant women who have made this idea that started as a conversation in a pub into a reality. We’re also in Brighton, Leeds and Manchester- dates below. Or if you can’t see the play, why not add your own story to the website? Or read the stories that have already been submitted. Because there really are some truly incredible women out there. And I feel blessed and honoured to know, have met, spoken to, or read the stories of, many of them.